A Square Foot Garden is more than just a perfect place to grow vegetables—it is an ideal environment for sharing and learning with kids of all ages. This book teaches you how. For two generations, Mel Bartholomew's top-selling Square Foot Gardening books have made his revolutionary system for growing vegetables available to millions of people. 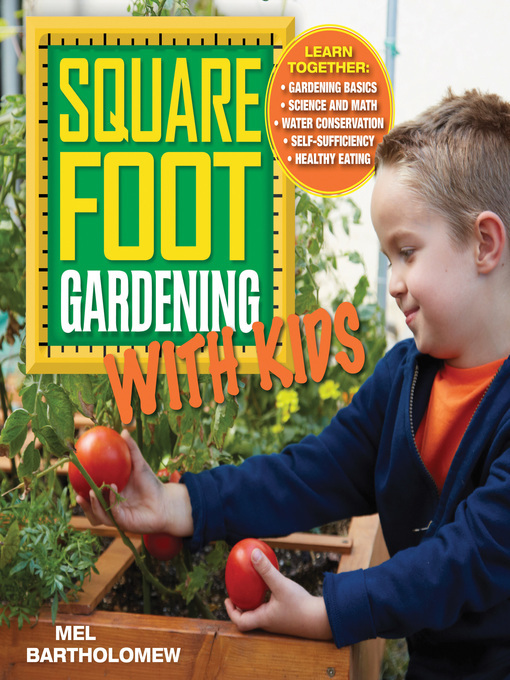 In Square Foot Gardening with Kids, Mel reveals all of the tips, tricks, and fun projects he has used over the decades in one of his most cherished pursuits: teaching youngsters to build and grow their own kid-sized SFGs. Because of its simple principles and fast payoff, Square Foot Gardening is perfect for children. The easy geometry of the gridded box breaks the complex world of gardening into digestible bites that are easy to approach and understand for enthusiastic young learners, and the sequence of tasks required to grow plants from seeds is repeatable and reassuring. Whether you're a grandparent, parent, teacher, coach, or any kind of role model to young people, Square Foot Gardening with Kids offers you the proven methods Mel has developed himself to entertain and amaze the kid in all of us. And, in the process, many valuable life lessons can be learned—such as the importance of following instructions and doing your chores, basic skills like counting and water conservation, and learning to appreciate the nature of food and why it is important to respect it. But more than anything, this clever, colorful new book captures the essence of growing edibles for anyone, regardless of age: it is fun and rewarding.